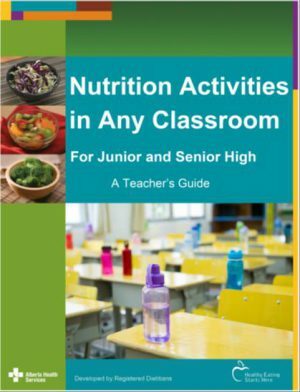 Alberta Health Services Registered Dietitians are pleased to share a new interactive resource: Nutrition Activities in Any Classroom (NAIAC) – A Teachers Guide. The activity stations contain everything you need to complete the activities including: printable station titles, activity descriptions and key messages, set-up instructions, worksheets and activity materials. Also included are discussion questions and answers, as well as supplementary information and resources. The activities support the Healthy Eating Messages on the Healthy Eating Starts Here website. We hope you have a chance to try it out in your classroom! You can find a copy of the toolkit at: www.healthyeatingstartshere.ca.